Microsoft will soon roll out an Office 365 service for surveys, quizzes, and polls for all commercial users. It is called Microsoft Forms, and I introduce it in a new Forms article in the kalmstrom.com Tips section. The name of the new Office 365 service can sound a bit misleading, but it is not a replacement for InfoPath. 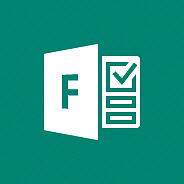 Instead Microsoft Forms is a basic app that helps you to quickly collect information via surveys and quizzes. Use Forms to conduct customer surveys, question trainees or applicants, ask team members about their opinion, yes, anytime when you want formalized input from several other people. What Forms replaces is rather the SharePoint Survey app. Forms is easier to use and the poll form is more mobile friendly than the Survey app. With Forms you can create a survey and then invite others to respond to it via any web browser. The surveys look good and is easy to answer even on mobile devices. The surveys can be shared with a link or be embedded in a web page or blog. As people submit their answers, the results are displayed in a graphic interface where you can evaluate them. The results can also be exported to Excel for further analysis. Forms became available in Office 365 Education subscriptions as early as in June 2016, as an answer to teacher requests for a tool that would help them assess student progress on an ongoing basis. The preview for commercial First Release users came one year later, and from 15 February 2018 Microsoft will start rolling out Forms to all tenants. By default, Microsoft Forms is turned on for everyone in the organization, but admins can turn Forms off and then on again for specific people. In the demo above I show how to create two different kinds of surveys, how to share them, how to reply to them and how to see the results. The next version of my book Office 365 from Scratch will of course include more information on Microsoft Forms.